Today, negotiation is almost a lost art. Most of us see a price and expect to pay it. In fact, if we’re outraged by a price we try to hide it to save face rather than call it out. But this hasn’t always been the case. Throughout most of the human history negotiation was a necessary skill, a basic part of life. You had to negotiate for food, transportation, almost anything. Still, even today you have to negotiate in both business and in life. That’s why you’ll want to be equipped with the right negotiating strategies to help you land a better deal. 2. What Are You Willing to Trade Off For? 16. Dr. Karrass Interview: "Partnering is a Marriage – Not a Long Date"
In business negotiations and private deals, few areas are set in stone. 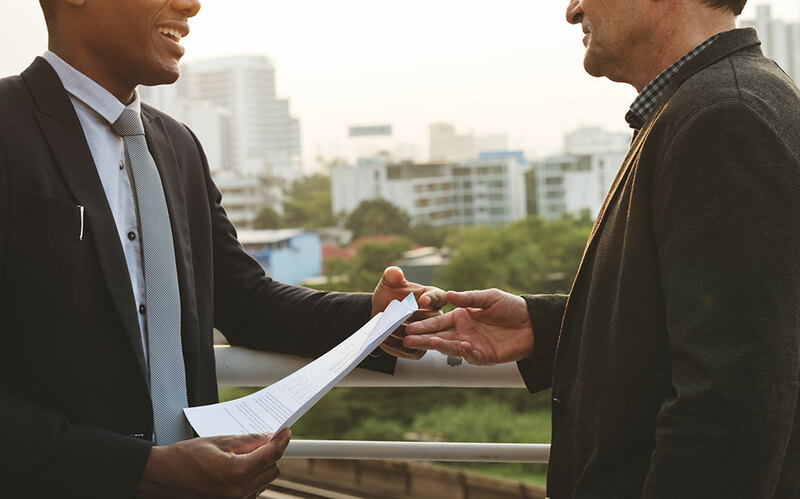 When both negotiators are fully dedicated to finding common ground, they can use the Both-Win® strategy to find a mutually beneficial arrangement. If you can’t get a higher price, perhaps you can convince your counterpart to change the scope of work; or make specification, division of labor, or quality control tradeoffs. Or, vice versa, if you can’t convince the other party to offer you a better cost, maybe you can obtain better payment terms or more services for the same price. What if we double the quantity? Would you consider offering us a discount? What if we buy an extended warranty? Would you consider offering us onsite support? What if we let you source the material? Can you offer us a quality guarantee? One last piece of advice: Don’t rush to ask both questions at once. Allow your counterpart to answer the first question in earnest; it’s possible they can offer you a better deal than you had in mind. Leave the closing questions for later if they haven’t given you a satisfactory tradeoff. Would you consider grade-B stock? Would the previous model be acceptable? “What if” we change the SOW? Regardless of how you choose to defend your interest, know that you should never answer a What-If immediately. Take time to think and make sure your What-If answer doesn’t lead down a rabbit hole. Say your asking price for a piece of real-estate property is $500,000. You’re in a bit of a rush to close the deal with a client and know that you could go as low as $450,000. That would allow you to obtain a profit even though you’d ruin your margin. Your client comes back and offers $460,000. It’s a bit more than the absolute low and it lets you go on with your life, so you quickly say yes, right? Wrong! Your client may feel suspicious if you’re willing to shed almost 10% of the value so quickly. Is there something wrong with the property? And how much was your initial margin, exactly? So you should ask for time to think about it. Perhaps you can go back and ask for $470,000. Then you could agree for $465,000 in another day or so. The delay is small enough and earns you an extra buck for your time. You bow to your pressures. Whether you’re a purchasing manager on a tight budget, or you have to report to your boss for new acquisitions, or you’re looking to buy a bigger home for your family, you have certain pressures to keep in mind—and you know it. Now put yourself into the other party’s shoes. What are their pressures? What do they need? Understanding the central pressures of your counterpart is vital. In this way, you’ll forge a better deal for yourself and for them. An experiment showed that when people were told to expect $7.50 from a negotiation, they got around $7.50. In the same conditions, people expecting to get $2.50 got around $2.50. This shows that expectation and achievement are closely related. So, what do you expect to get from your next negotiation? The Bogey is, in essence, telling your counterpart, “That’s all I got!”. Say you’re looking to renovate your home and have a budget of $10,000, but the local seller sends you an offer for $15,000. Perhaps you could find a little extra money, but you’re not really willing to spend more. So let your service provider know that $10,000 is all you can afford. They will either take your offer, or let you know what is doable for your money. In the meantime you’ll learn a lot about furniture, wall treatments, and light fixtures, which will help you make an informed decision. The larger the expenditure, the more necessary the Bogey becomes. Change the negotiators, either the team leader or the whole team. Change the time-scale of the contract. Change the shape and flow of payments. Deadlines are powerful because they force action. Buying gifts for Christmas, catching the train, and arriving at work are but a few examples illustrating how people behave when confronted with time pressure. Deadlines force people to choose either one or the other. A deadline’s implicit threat is that lack of action has unpredictable consequences. Yet you can never be certain that a negotiation deadline is real, so be wary of them. At the same time, know that deadlines are as real as the beholder believes them to be. So test other people’s deadlines—but set your own. Psychiatrists liken deadlock to alienation; both have a traumatic effect on people. Rather than sacrificing their feeling of belonging, people prefer to distort the truth. Given how negotiators fear deadlock, they will go to great lengths to avoid it. Therefore you may not feel at ease using it as a negotiation tactic. It’s powerful, it’s uncomfortable. So use it sparingly. When you hear an ultimatum in negotiations, you can never know if that really is the last and final offer. It’s important to understand what the final offer is for. Content: What are we talking about? Is this the final offer for the house, or for the house and patio furniture? Consequences: If you don’t accept my offer, call me. Or send my check back? Firmness: If you don’t agree in three days, tear up the check and forget the deal. I’m going to Europe. Time: If you don’t agree in three days, I’ll be back in a month. So don’t jump to conclusions and always consider content, consequences, firmness, and time. There are some places where take it or leave it is not an alternative, like labor negotiations. Take it or leave it should be avoided any time this negotiation strategy can poison the well. Because if you’re not willing to walk away from the table for good, or you simply can’t, take it or leave it won’t work. When the other party can’t afford to leave it. When you want to discourage future haggling, or you’d be selling at a loss. 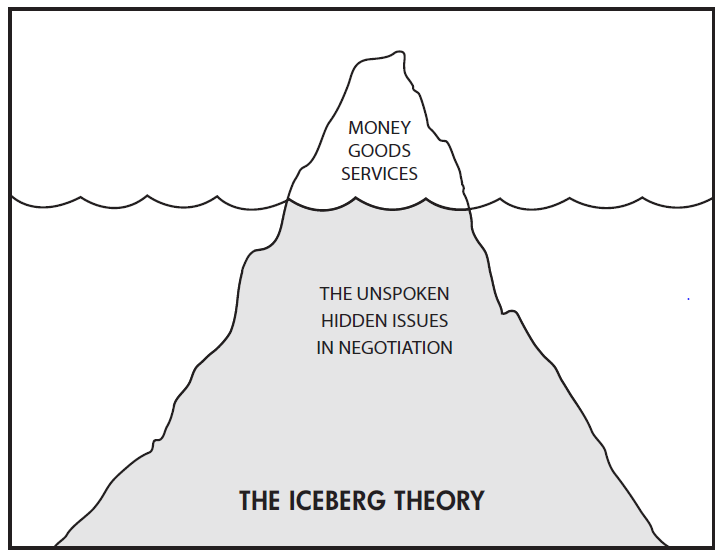 The iceberg represents the needs, wants, and motivators of your negotiation counterpart. Although you can readily see some of these needs, most of them loom unspoken under the surface. If you’re unaware of these hidden needs and fail to offer satisfactory boons to cover them, it will be much harder to reach an acceptable compromise. Sometimes these needs have a structure to them, like in Maslow’s hierarchy of needs. Other times they will come at random, and it’s up to the negotiator to discern which are the most important. People want to be perceived as competent. They want to keep their jobs and positions. They want to be dealt with honorably. They care about their relationships. Unless you’re negotiating for your own purchases, you’ll need a negotiation team. Each person in this team brings their unique skills and expertise to the table. Ideally, these skills should complement each other. Individuals tend to dwell on their own side’s limitations, whereas groups reinforce each other’s strength by challenging their team assumptions and constraints. At the same time, if these people are from different company departments, with enough negotiation training, they will have direct input in the outcome of the deal. Say you’re looking to sell a home and the buyer wants the chandelier and rugs thrown in. You finally agree and concede to leave these for a very low price just to get on with the transaction. The next morning when you meet the buyer, they also want a very low rate on a small mortgage and a slow-paced return plan. But these requests never came up before! Of course, this can be an unethical negotiation strategy, or it can be a genuine lack of understanding from the buyer. Either way you can placate this with your own escalation. You are surely taking a risk if you say that the buyer’s proposed mortgage terms are unacceptable. But you also send a very strong message that the buyer can’t push their way through the deal. Partnerships, like marriages, must have a structure regulating the long-term evolution of the relationship. More importantly, though, you will need a divorce procedure if and when you want to break up with your partner company. What are the acceptable costs for labor and overhead? When the buyer settles for a smaller deal than expected, who takes the hit? 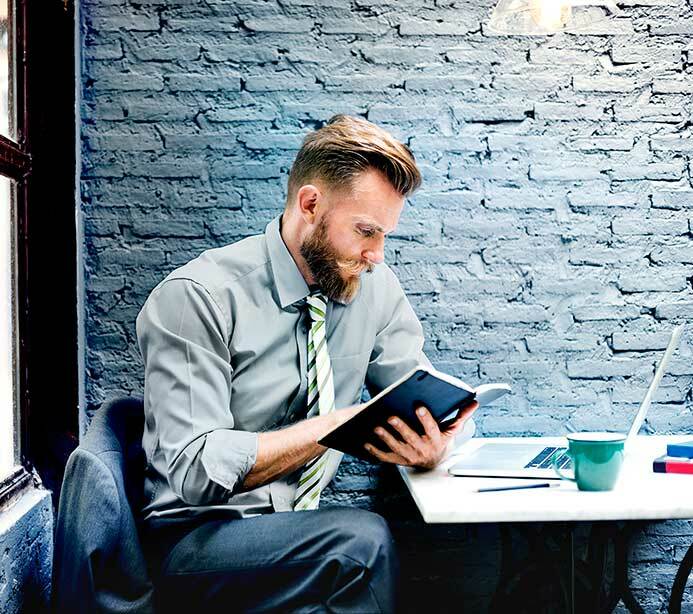 Should the partners’ information systems communicate? Even those involved in finance and accounting? Is one partner required to always bring the other in on a deal? As always, answers aren’t easy—but they can be negotiated. Good business judgment and the ability to spot the real bottom-line issues. Being comfortable and keeping a cool head in ambiguous and conflicted situations. The ability to negotiate effectively with members of their own organization and win their confidence. The willingness and commitment to plan carefully and to know the product, the rules, and the alternatives. Having the courage to probe and check information. Traveling exposes us to many different cultural circumstances. In some countries you’re expected to negotiate hotel room prices. In other places you’ll find sprawling bazaars, where half the fun is negotiating everything; in Turkey it’s almost impolite not to haggle. From marketplaces to towering New York offices, the ability to negotiate will always be the most useful asset you have.